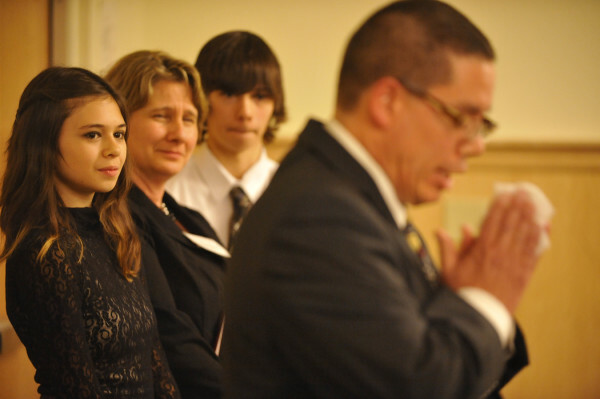 Nicole Maines (from left), 14, her mother Kelly Maines and her twin brother Jonas listen to Wayne Maines (right) as he delivers a stirring speech about their experience in helping Nicole seek justice and acceptance as a transgender youth. BANGOR, Maine — A final order has been issued in a transgender student’s lawsuit against the Orono School Department over the denial of her access to the girl’s bathroom in grade school and middle school. The Penobscot County Superior Court order, dated Nov. 25, enjoined the school department from discriminating against other students as it did against Nicole Maines, 17, who lives and attends private school in Cumberland County. The court also awarded $75,000 to the Gay & Lesbian Advocates & Defenders in Boston and Berman Simmons, a Portland law firm, which represented the girl and her parents. “A significant portion of the monetary award will go to the Maines’ family,” Carisa Cunningham, spokeswoman for GLAD, said Monday. She declined to say exactly how much the organization would retain and how much would go to the family. The father said Nicole Maines and her twin brother, Jonas Maines, are high school seniors and are visiting colleges. He said the subject of his daughter’s gender identity has not come up during campus tours. The lawsuit was the first in the country to challenge a transgender student’s access to the bathroom of the gender with which the child identified, according to Cunningham. “We’re grateful that it was resolved favorably, not only for Nicole and her family but for all transgender students who are just seeking to get an education like every other student,” she said. This case has raised the visibility of the issue of transgender students in schools and “the good ways that schools can address these issues and the bad ways that schools can address these issues,” she said Monday. “We hope this will be a legal building block on how to address these issues,” Cunningham said. Wayne Maine, his wife, Kelly Maines, and the Human Rights Commission sued what is now Regional School Unit 26 in 2009 in Penobscot County Superior Court on behalf of Nicole Maines. The commission previously ruled in the girl’s favor against the district. In November 2012, Superior Court Justice William Anderson ruled in the school district’s favor. The Maine Supreme Judicial Court reversed that ruling in a 5-1 decision in January of this year. The lawsuit did not name the family, who later publicly identified themselves as the one referred to in the complaint as John and Jane Doe. Nicole Maines was named in the lawsuit as Susan Doe. During the past five years, Nicole Maines and her family have been honored by GLAD and the American Civil Liberties Union of Maine. Last month, Glamour magazine named Nicole Maines one of 50 “hometown heroes” — one woman from each state that the magazine honored for making a difference in America. The teen told the magazine she hopes to be an advocate for other transgender youth and hopes her story can be an inspiration to them and to young people in general. Correction: A previous version of this story inaccurately stated GLAD took the case on a contingency basis and omitted the name of the Portland law firm named in the order.